Neighborhoods such as Greenwich Village are comprised of many communities and places that act as a backdrop for individuals’ daily lives. The parish of Our Lady of Pompei provided countless Italian immigrants with both, and continues to be a spiritual center to this day. 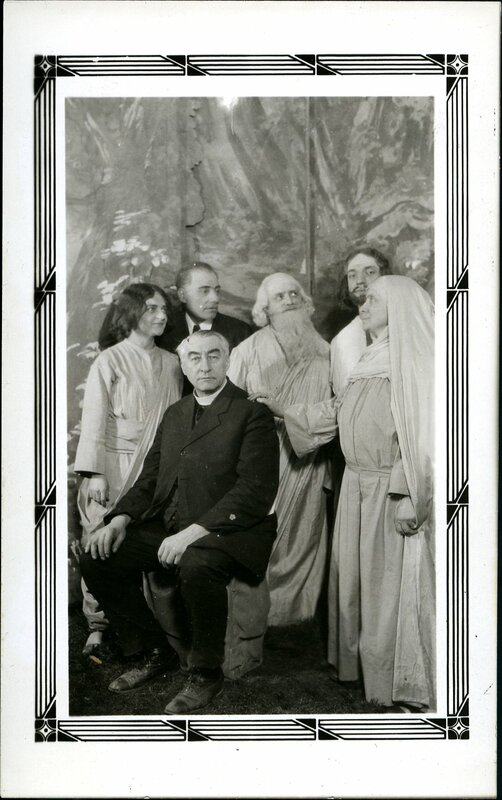 Photographs collected by Father Antonio Demo, who served the parish between 1899 and 1933, give insight into the experiences of the Italian-American community as they arrived and adapted to life in United States, and give a sense of the Greenwich Village in which they lived. Father Demo with parishioners in costume. Passion Plays and other performances were significant events for the community and also a substantial source of revenue for the church. The parish was founded in 1892, during a period of extensive immigration from Italy to the United States. An Italian bishop named Giovanni Scalabrini was behind the founding of two immigrant-focused organizations in 1887, both of which would be associated with Our Lady of Pompei. The first was a religious community called the Pious Society of St. Charles (members were often called Scalabrinians), with a focus on serving religious needs of the immigrant population. The second was the Saint Raphael Society, and it helped Italians face the worldly travails of immigration such as government regulations and unscrupulous countrymen looking to exploit their trust. Our Lady of Pompei was initially located near the harbor to be close to the incoming immigrants, but eventually moved to to the Village. Many of the immigrants that the parish had been serving were arriving from southern Italy. With the move to Greenwich Village, it also began to serve the Italian-speaking community of the surrounding neighborhood, many of whom had come from the area around Genoa. The church would have several homes in the Village, including 113 Waverly Place and 214 Sullivan. In 1897, the church on Sullivan was the site of a gas explosion that killed two men and injured the priest, Father Zaboglio. 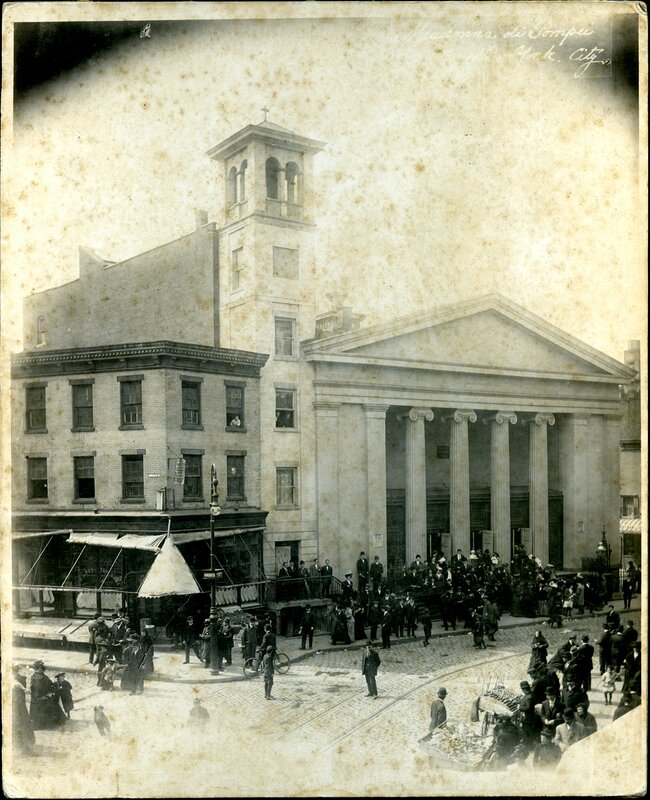 In 1898, the church moved to 210 Bleecker Street, into a church that had been built by Unitarians in 1836, and had been serving the Catholic congregation of St. Benedict the Moor, which was moving uptown. The exterior of Our Lady of Pompei’s home at 210 Bleecker Street. This building would remain Our Lady of Pompei’s home until city plans to redesign Sixth Avenue would lead the congregation to build a new church and move to its current location on Carmine Street in 1928. The following year, Our Lady of Pompei would receive a new pastor: Father Antonio Demo. Born in Italy in 1870, Demo served in the Italian military before being ordained. In 1896, the Scalabrinians sent Demo to America. He first went to Boston, where he would serve until coming to New York as Zaboglio’s assistant. Demo kept extensive records over his decades as priest, which can be found in the parish’s records at the Archives of the Center for Migration Studies. These records include three folders of photographs and portrait postcards that Demo collected, some of which are shown here. While many of the photos are unlabeled, they bring to life the experiences of the community and events at the church. Some of the photos came to Father Demo from Italy, reenforcing the personal and cultural connections that the Italian community maintained with their homeland, even as they assimilated into the broader American culture. The photos also contain portraits gifted to Demo by parishioners. Father Demo not only supported the congregation’s spiritual needs, but also served as a counselor, reference, and an intermediary with the government and outside social welfare agencies. Father Demo’s photographs bring to life the experiences of a community and the Greenwich Village where they lived and worshiped. 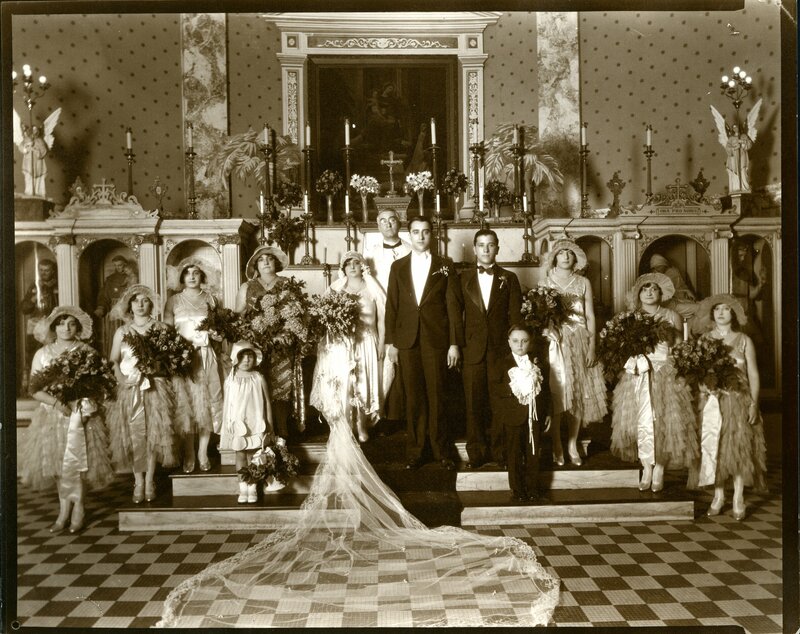 Father Demo at wedding in the 210 Bleecker Street church. Brown, Mary Elizabeth. From Italian Villages to Greenwich Village: Our Lady of Pompei, 1892-1992. New York: Center for Migration Studies, 1992.